We had a prenatal diagnosis. It was very early, around 15-16 weeks when we were first told about the possibility of Down syndrome. The doctor’s office handled it very poorly from the first phone call, so I was very scared and very confused. Like many doctors., ours pushed termination as an option. Although we told him it was not an option for us, he continued to aggressively push for termination 3 different times over the next six months. One of the times being late term. He stated that he did know doctors that would still terminate if that is what we wanted to do. He cornered me without my husband present, asked if it was really what I wanted, and suggested that he had a nurse that was very Catholic, but still had decided to terminate her baby with Down syndrome. I suggested he never raise the subject again. After that experience, I pushed to get into another OBGYN practice. I also pushed to be connected with experts at The National Children’s Hospital so that I could get the screenings my baby needed. It was a heartbreaking and confusing experience, but I learned a very important lesson about advocating for myself and my children. My delivery ended up being lovely. We told the doctors that we wanted everyone in the delivery room to know that we had a prenatal diagnosis of Down syndrome and that we were thrilled about it. After she was born there were extra tests for her and appointments since she had been prenatally diagnosed with heart conditions, but we still went home after 2 days in the hospital. Despite all my fear of the unknown, it was just like having my first child. She was our beautiful baby. I love the quote that says that no one knows how much they are going to love a child until they meet them. We couldn’t wait to bring her home to be with her big sister. It was Christmas time so there was a lot of warmth and celebration. Our families were so thrilled to meet her and Amelia wanted to hold her and bring her things. CC was a BIG snuggler and slept great! The aspect that was different about bringing home a child with Down syndrome was the anxiety about all of the things that needed to be done to make sure she was healthy and has the things she needs to meet her potential. By that, I mean the appointments she needed in order to follow the Down syndrome medical guidelines and the programs to sign up for with the county for early intervention. It is hard not to be overwhelmed. CC has done beautifully. She is so incredibly determined and has worked very hard with PT and speech appointments every week since she came home. At 19 months she is walking like a champ. She does 10-15 signs and has about 10 words that we can understand. She also eats wonderfully. All of this is despite 4 hospitalizations, open heart surgery at five months, a feeding tube at home for 2 months, and continued issues with severe aspiration. I think it is simply how typical she is. I have said many times that it is just like raising any other child. There are challenges, and in some areas we have to work harder. However, I think you can say that about any child or family. Our oldest, Amelia, has a life threatening peanut allergy and is extremely active. Those are things that we and she will conquer with attention and hard work. It is the same with CC and Down syndrome. Whatever we have placed before her she has risen to the task. We have also been amazed by the impact that having CC has already had on the people and the world around us. I call this the Power of CC. There have been so many incredible things that have happened through having her. Our friends and family have learned so much about Down syndrome and inclusion. Many of them even did their own research and have gone out of their way to understand what challenges we will face. After CC’s heart surgery we raised money for the National Children’s Hospital for other children that will be treated there and don’t have the resources for the things they need when they are discharged. It was amazing to to see the response from friends and family. We have met leaders in the DS community that have worked tirelessly and have already accomplished so much. Giving us the opportunity to work on legislation in Washington, DC that will increase the national budget for research on Down syndrome and related diseases that also impact 60% of Americans, like Alzheimer’s and cancer. We have been connected with other families that are going through a prenatal diagnosis or open heart surgery and lent what support we could. We have met people doing every day activities that we ended up connecting with the amazing medical experts and researchers at the Global Down Syndrome Foundation so they could get answers to challenges they were facing. 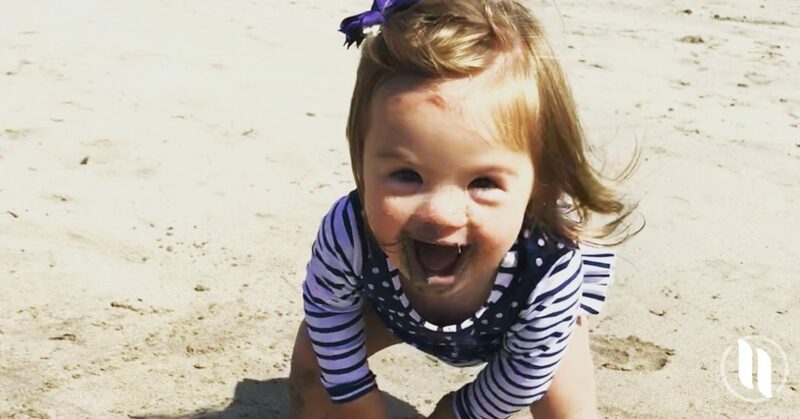 The best thing is that CC’s smile brings light wherever she goes and people want to connect and talk about Down syndrome. We love to have dance parties. Since CC could sit up she would bounce to the music and when she could crawl she would crawl in circles to twirl like her sister. Now that she walks she full on dances and she yells at “Alexa” as if she is asking her to play a song! We love to travel. We have taken the girls everywhere, including Ireland this year! CC loves books, so we read as a family. She will pull each on out of the shelf, point to things and turn the pages, and then ask for another. Besides our experience with our first OBGYN we have also faced many medical challenges. CC was hospitalized at four weeks old with bronchitis and then again at 2 months with RSV. She was then diagnosed with aspiration of liquids and given a feeding tube at home to help her gain weight and get food into her. CC continues to have respiratory issues related to her small airways, but she doesn’t let it stop her. She is very strong. In addition, CC was diagnosed prenatally with a ventricular septal defect (VSD), which is a hole between the heart’s lower chambers. When she was born she was also diagnosed with an atrial septal defect (ASD), or hole between the heart’s upper chambers. The doctors had originally hoped that these would close on their own, but CC struggled to gain weight and further testing showed that the holes were continuing to grow, especially the hole at the bottom of her heart causing cardiac-related issues in her lungs. She had open surgery at five months to correct these defects. She has thrived since the surgery. Maybe you have never met someone with DS or if you have, you haven’t known what to say or how to act. That’s okay and it’s okay to cry and be scared of the unknown. I promise that you are about to have the greatest joy and love in the world and you will know what to do when the time comes. Take a deep breath. Enjoy your pregnancy/their birth. Take one day at a time. As hard as it is, don’t try to read everything and have all the answers at once. Make a list of the questions you have big and small and don’t be afraid to ask them. Don’t be scared to speak up. You know your child best and the medical community doesn’t always have the right answer right away. Create a network of support. I am not a joiner, but I have made myself reach out to others and be willing to take the offers of support and advice that I have been given. You will love your child so much it will make your heart burst. Like with any child, you will love watching them meet their potential. You will see the world around you change for the better. This is not just lip service. There is something about having a child with Down syndrome that makes meaningful connections and opens up a whole new world. You will experience true and uncomplicated happiness. It is hard to be worried about the little things and not be grateful for what you have while you are watching someone you love with all your heart meet the challenges they face. I don’t think people outside the Down syndrome community- even some within- realize how common it is to pre pressured to abort. Fortunately, I found my OBGYN through a pro-life website and so I never felt pressured, although the genetic counselor (who was not a part of my doctor’s practice) asked if we were going to terminate. We never went back. we had same experience with doctors but decided to keep and she is the life if our family.